Malá Strana translates to ‘Little Side’, or ‘Lesser Side’, which refers to its position on the left bank of the Vltava, below Prague Castle. 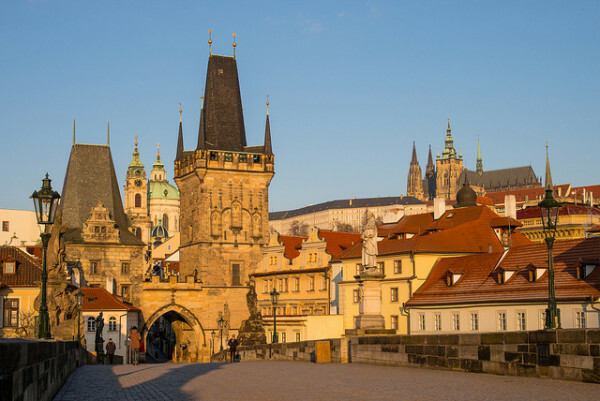 As well being right by the castle, Malá Strana is just over the other side of the beautiful Charles Bridge from central Prague and its many treasures. 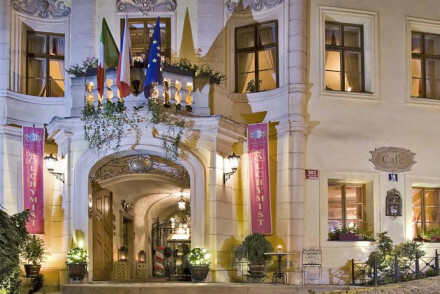 So choosing to stay in one of the best hotels in Malá Strana will see you well located for sightseeing on foot, and in amongst some of this city’s most beautiful and historic cobbled streets. Malá Strana’s graceful, largely Baroque, architecture doesn’t truly date the area, it was burnt down in the 16th Century and rebuilt, but there have been streets and buildings here for a lot longer. 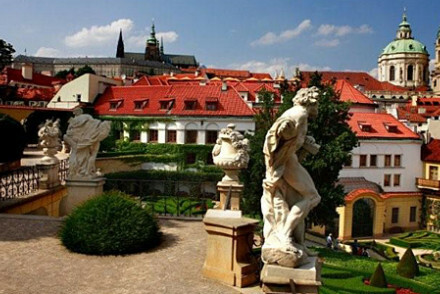 One of the most impressive Baroque buildings is the Wallenstein Palace, which includes 16 houses, five courtyards and a huge garden styled like a French Park. But the churches might be even more impressive - St. Nicholas with its huge, green cupola is probably most famous. And then of course there’s the Charles Bridge and all its glorious statues and monuments, its stallholders, its visitors and appreciators. It’s been flooded many times in its long history - its construction was finished in 1390 - and one of the most fascinating markers on the bridge is the ‘Bearded Man’, a carved stone head on the Staré Město side of the bridge: when the water reached this level locals knew it was time to head for higher ground. Petřín Park is another wonderful place to stroll, which people local to Malá Strana seem to have sole use of at the beginning and end of the day. 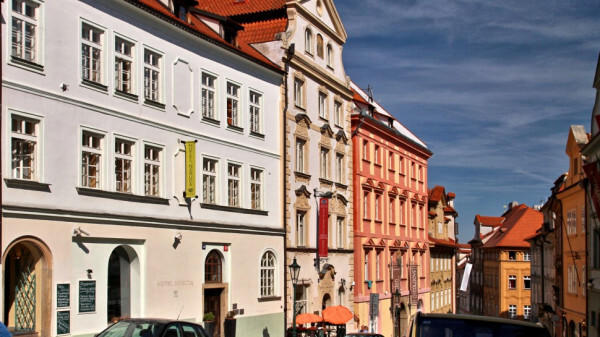 You’ll also find John Lennon’s Wall, the charming Savoy and the Shakespeare and Sons bookshop in Malá Strana. 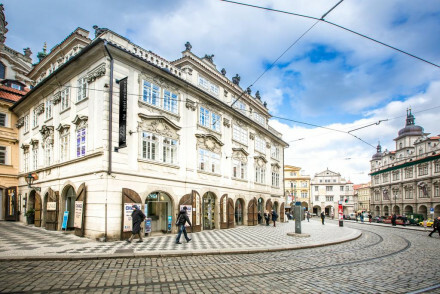 The Aria Hotel, Prague is a wonderfully quirky hotel with historic architecture, modern design and a classical music theme. There are 51 grand bedrooms and suites - all with individual decorations and some with a private balcony. There’s also an excellent restaurant and a spa. And they have family suites too. 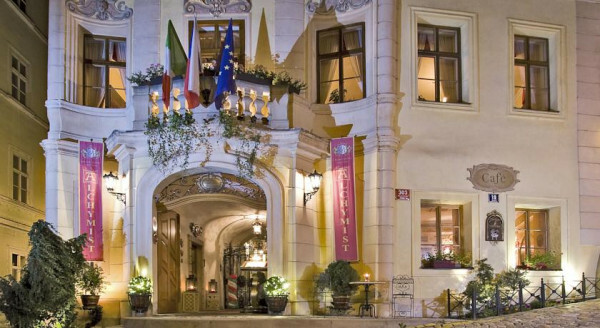 The Golden Wheel is a four star hotel on historic Nerudova street. 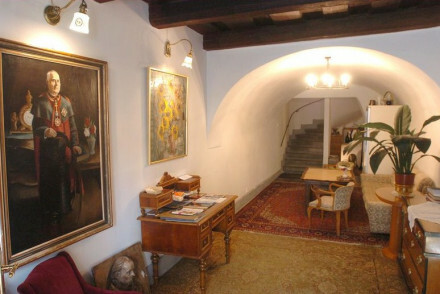 The facade is Baroque, but inside its 17 rooms are cosy and romantic, with wooden floors, whitewashed walls and lots of natural light. 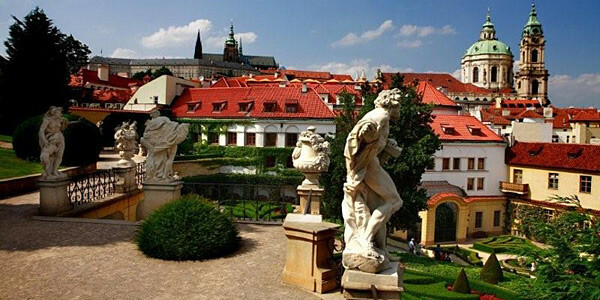 Guests have views of Prague Castle and Petřín Park, and there’s a small Italian coffee shop at street level. 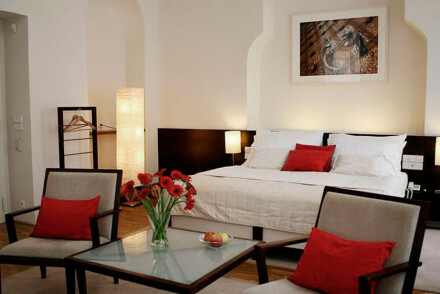 The Nicholas Hotel Residence is a collection of nine rooms and suites, each with their own kitchenette, located on Lesser Square. The decor is romantic and cosy - think exposed beams and wooden floors. And even though you have a kitchenette, they still offer a complimentary continental breakfast each morning. 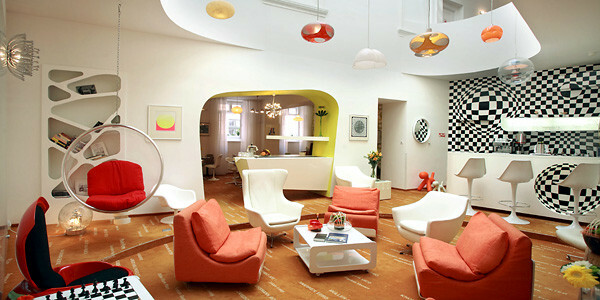 Domus Balthasar is a charming hotel in a great position just a stone's throw from Charles Bridge. The decor is simple but chic, with exposed wooden beams and plenty of white. There are just eight rooms. The Appia Residences are a collection of 21 rooms, suites and apartments in an attractive sandstone building close to Prague Castle. Built around a central courtyard and gardens, the rooms are mainly traditional, but with plenty of natural light and some contemporary style. 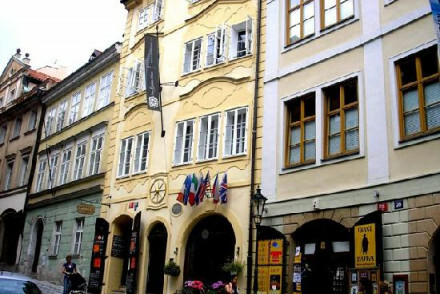 The Hotel Sax is a contemporary boutique hotel with 20 rooms tucked away in the Old Town. 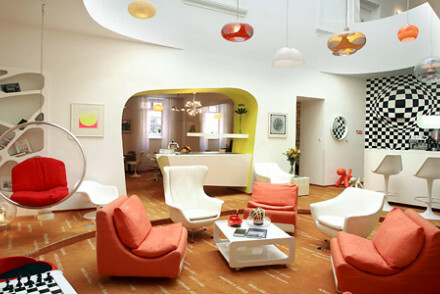 The decor is fun and funky - think bright colours and eclectic, 60s era art - with excellent views of the skyline from those rooms with their own balconies. 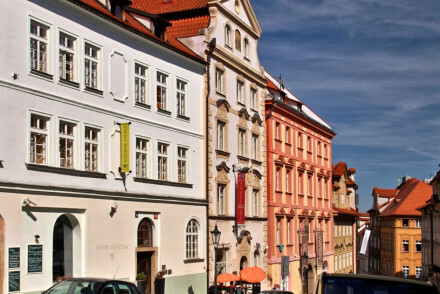 Rooms start from as little as €72 per night including breakfast..
Dum u Velké Boty ticks all the cosy, family-run B&B boxes while still being very affordable. 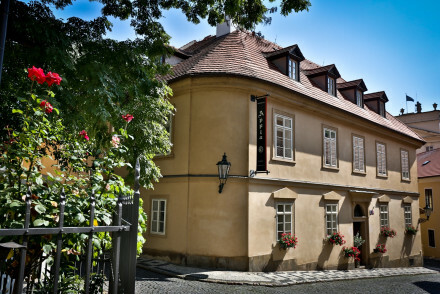 An unassuming home from home with only 12 bedrooms, if you stay here you’re just 10 mins walk from either Prague Castle or the Charles Bridge.